Vindalho is a popular Portuguese dish preparing by marinating pork pieces in a mixture of red wine vinegar. Vindalho is a spicy aromatic dish very flavorful and appealing. Vindalho is unique and special with pork bits drenched in a thick spicy mixture that goes well with rice and almost anything. Vindalho can be easily prepared at home with readily available ingredients. 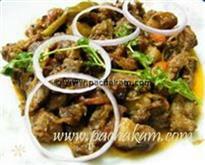 Marinating helps in proper penetration of spices deep into the pork meat. You can explore a well illustrated Vindalho dish here.